PARIS, May 16 (Xinhua) -- French President Emmanuel Macron on Wednesday said the comprehensive strategic partnership between France and China should play a "leading role" amid the current complicated international situation. Macron made the remarks during his meeting with visiting Chinese State Councilor and Foreign Minister Wang Yi at the Elysee Palace. France wishes to further strengthen its strategic communication and collaboration with China to maintain multilateralism, said the president. Macron recalled his visit to China in January, during which he reached consensus with Chinese President Xi Jinping on further developing France-China ties. The French president urged both countries to propose and implement concrete plans to increase high-level visits, strengthen cooperation in various fields including trade, science and technology and culture, and explore the potential of collaboration on the Belt and Road Initiative (BRI). 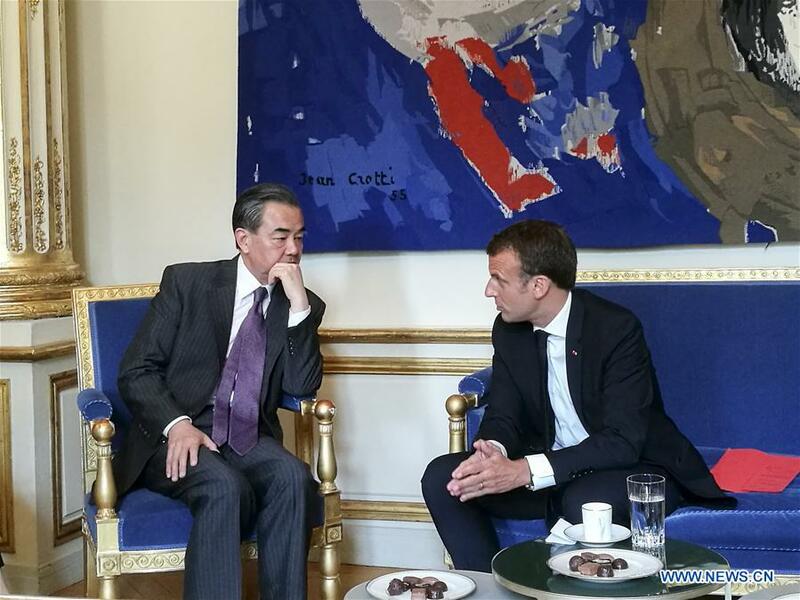 Wang said China believes that France would make an important strategic partner in implementing the BRI, and that China is willing to work with France to promote multilateralism. He underlined that China attaches importance to the role of France as a great power, and appreciates France's independent foreign policy. China is willing to further deepen high-level contacts and mutually beneficial cooperation with France, Wang said, adding that the two countries should safeguard the global system and principles of international relations, and be the "positive voice" in maintaining world peace. Wang also met with Philippe Etienne, diplomatic adviser to the French president, with whom he discussed bilateral cooperation in various fields under the BRI framework and on other major issues such as climate change. Wang and Etienne agreed that China and France, both permanent members of the United Nations Security Council, should strengthen strategic communication and coordination to promote peaceful political solutions to regional issues, and to inject more positivity to the uncertain and unstable international situation. On the same day, Wang also met with Laurent Fabius, president of the Constitutional Council of France.